If I had to pick an all time favourite fabric type it would be rayon. So soft, and smooth, and drapey, and easy to iron. Yes it does crease but never crumples too badly. It gets a bad rap, rayon. While bamboo and tencel are all the rage, some people seem to hear rayon and think nylon (most notably Anna Wintour in the The First Monday in May, sneering at the curtains for the Met ball "is that nylon, rayon, urgh" sneering laughter) when in fact rayon is a natural fibre, albeit heavily processed. However just like bamboo and viscose and cupro and tencel, rayon is a cellulose made from wood pulp I understand, and considered semi synthetic, but it's breathable and can take a hot iron. Spotlight always has a heap of rayon in variety of prints, often with a navy, black or white background. Some seasons are better than others but recently the selection has been pretty good and included a lot of florals and birds. I think it must be mass produced in huge quantities in China because I've seen it photos online of fabric stores in far flung places like Hawaii. It comes in the awkward width of 135cm (53") which means I'm never quite sure how much to buy because most patterns give recommendations for 115cm and 150cm width, and I always end up buying too much, which is what happened with this. Oh well, it can be another Ogden Cami or pocket linings or something. 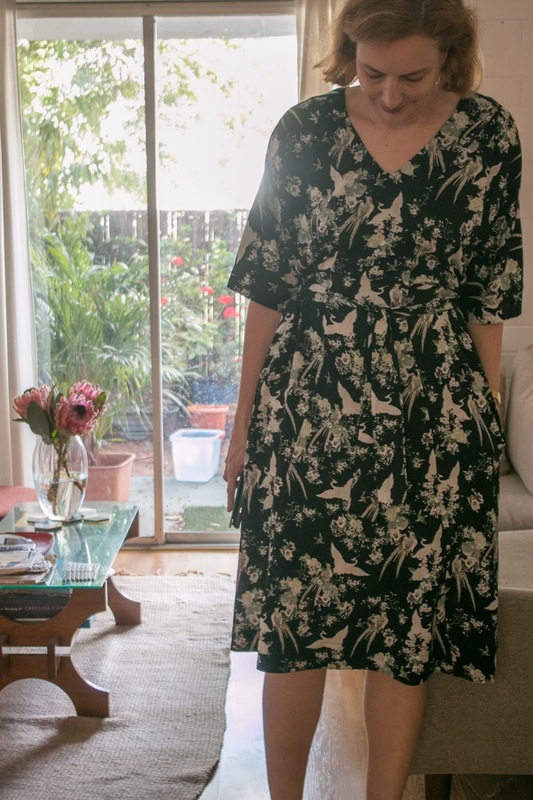 Anyway, to this dress, which is made of naffly titled 'birdy garden' rayon from Spotlight. It's the Sew House Seven Tea House dress pattern, which I have made before, but inspired by Vogue 9253, which is top of the pops in sewing instagram land at the moment. 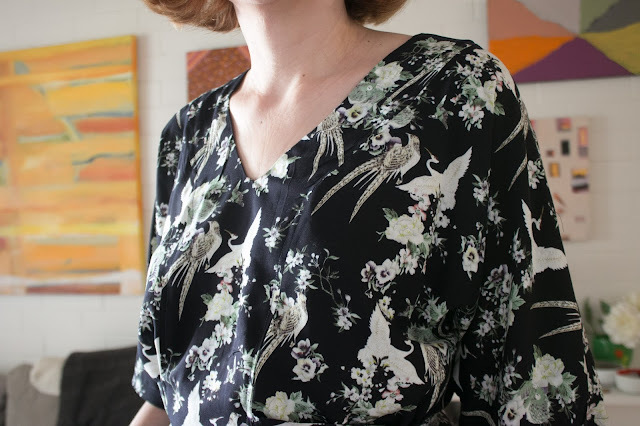 I wanted the v-neck, the flowy sleeves and skirt of the Vogue dress, without the incredibly deep V or the hassle of dealing with a tissue paper pattern, so I decided to modify the Tea House dress instead. I lowered the neckline by about 3cm, and probably could have gone further, added 6cm to the bodice and took 6cm off the skirt panels, to make the ties hit closer to my natural waist. I also omitted the front pockets and added side seams pockets instead. 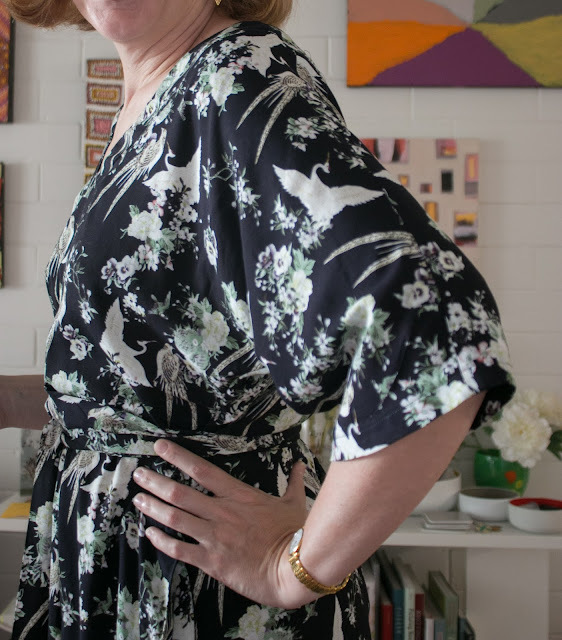 I left off the sleeve cuffs and extended the kimono sleeves by about 13cm instead, and just hemmed the sleeves. And I made it long but then hemmed it knee length after trying it on. I am pretty happy with how this turned out. I wish I'd taken more off the neckline but it's ok as it is. 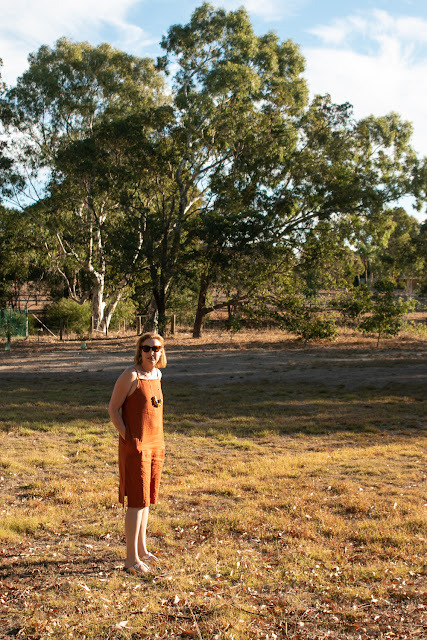 The dress itself is lovely to wear, the rayon is lovely soft stuff and when the spring weather comes back (it was sunny for a few days and then the storms started) I think it will be great for summer nights out and maybe even for work.